Cactaceae (Berlin) 1942, Pt. 1, 21 (1942); cf. Gray Herb. Card Cat. 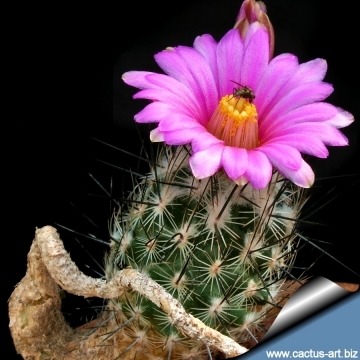 is one of the most fascinating and unusual cacti. It has a tuberous root from which arises an extremely thin neck, ending in an enlarged top-shaped plant body, there is little chance of the thin neck support the stem vertically. Altitude: Around 1400-1700 metres above sea level. Habitat and Ecology: This Turbinicarpus grows in low xerophytic shrubland on shallow slopes and in calcareous and gypsum soils together with Pelecyphora strobiliformis, Pelecyphora pseudopectinata v. rubriflora, Thelocactus hexaedrophorus, Ferocactus steinesii, Glandulicactus uncinatus, Coryphantha bergeriana, and Echinocereus pectinatus. It is endangered because it has a relatively restricted range, occurs in five locations, and it is sought after by collectors who cause a continuing decline in the population. Gymnocactus mandragora (Frič ex A.Berger) Backeb. Lodia mandragora (Frič ex A.Berger) Mosco & Zanov. Echinocactus beguinii F.A.C.Weber ex K.Schum. 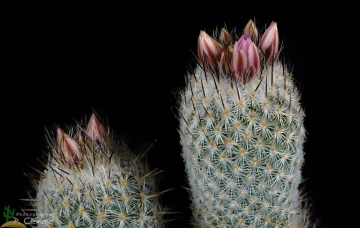 Gymnocactus beguinii (F.A.C.Weber ex K.Schum.) Backeb. 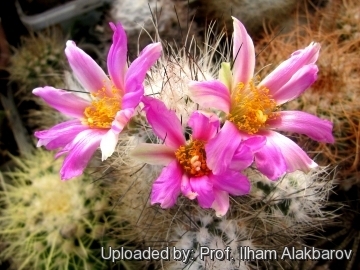 Mammillaria beguinii (F.A.C.Weber ex K.Schum.) hort. 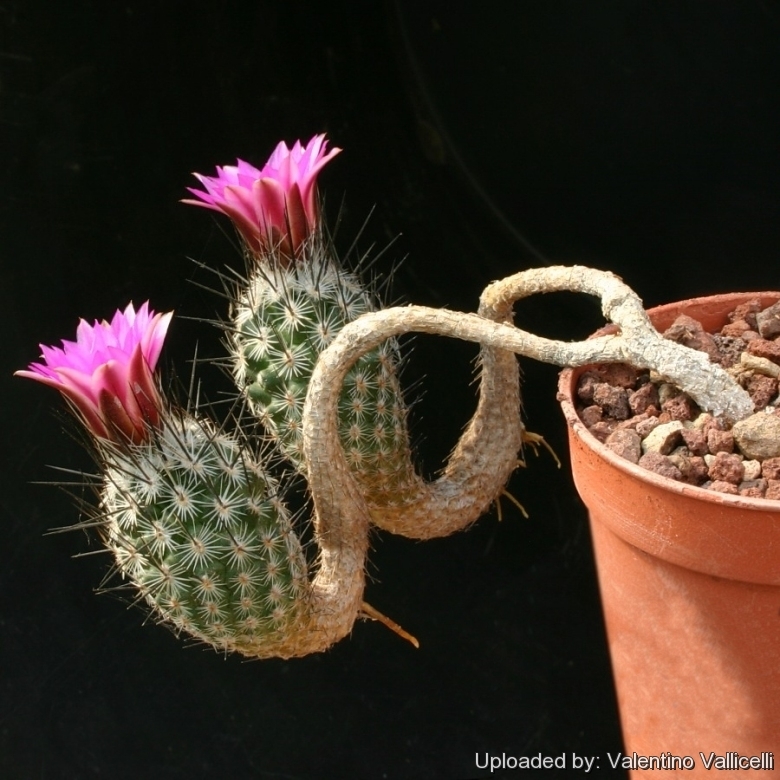 Turbinicarpus beguinii (N.P.Taylor) Mosco & Zanov. Turbinicarpus pailanus Halda & Panar. 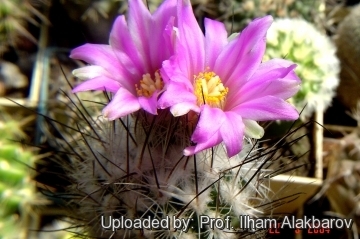 Description: Turbinicarpus mandragora subs. 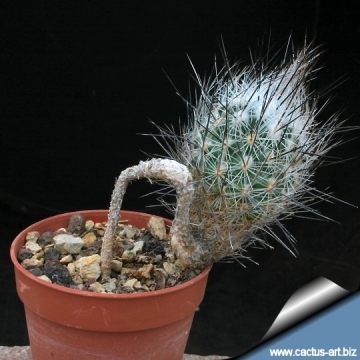 subterraneus (sometimes listed under its old name Gymnocactus subterraneus) is a small tuberous root from which arises an extremely thin neck, ending in an enlarged top-shaped plant body, there is little chance of the thin neck support the stem vertically. 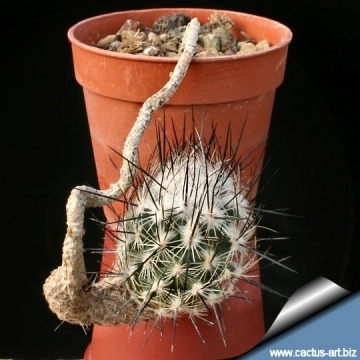 Habit: Usually solitary unless damaged. Stem: Club-shaped, up to 150 mm high, 30 mm wide, green-bluish. The stem is typically prostrate, flaring out after a very long slender neck that separates the large tuberose root from the enlarged apical part of the plant. Apex woolly. Tubercles: Four-angled, 3-5 mm tall. Radial spines: 16-19, straight, radiating horizontally, glassy white, 2-6 mm long. Central spines: 2 straight, erect, blackish-grey, 20-23 mm long, one erect, the other on sideways. Flowers: Whitish, rose violet to pinkish-magenta, with pink or brown midstripe, in summer, 20-25 mm long, 30 mm wide. Fruits: Greenish-brown, small, relatively dry, and unattractive. Turbinicarpus beguinii subs. albiflorus: has white or very pale pinkish flowers. Distribution: Southern Nuevo Leon? Turbinicarpus beguinii subs. hintoniorum A.Hofer: has pale greenish yellows blooms. Distribution: Southern Nuevo Leon, Mexico. Turbinicarpus mandragora (Frič ex A.Berger) A.D.Zimmerman: Solitary (may branch if the growing tip is damaged) Stem grey-green , 4-6 cm in diameter that become narrower at the collar. It has strong tuberous roots. Distribution: Coahuila: Parras, Viesca. Turbinicarpus mandragora subs. beguinii (N.P.Taylor) Lüthy: has mostly 12 closely packed, radial spines, up to 17 mm, snow-white, almost glass-like, black tipped. Central spines 1, much longer up to 30 mm, stronger, white with dark brown to black tips. Distribution: Zacatecas, San Luis Potosí, Coahuila to Hidalgo. Turbinicarpus mandragora subs. 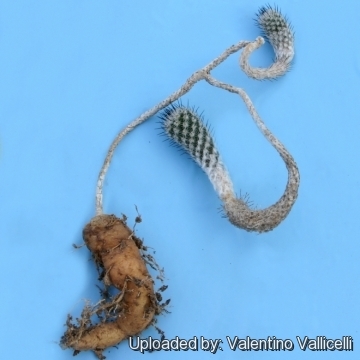 booleanus (G.S.Hinton) Lüthy: has a tuberous root, connected to the stem by a narrow neck 1-5 cm long. Central spines 2, erect, whitish with dark brown tips, 12-21 mm long. Radial spines usually 18-20 white, 3-17 mm long. Distribution: San Roberto, Nuevo Leon. Turbinicarpus mandragora subs. pailanus (Halda & Panar.) Lüthy: has a napiform and bundled root connected to the stem by a narrow neck. Stem olive green becoming corky as it ages. Radial spines 11-16 to 10 mm long. Centras 2, one erect one horizontal to 25 mm long. Distribution: Coahuila, Sierra de la Paila. Turbinicarpus mandragora subs. subterraneus (Backeb.) Lüthy: has club-shaped stems, up to 150 mm high often prostrate, separated by a slender snaky neck from the tuberose root. Radial spines 16-19, radiating horizontally. Centrals 2 straight, erect: Distribution: Doctor Arroyo and Mier y Noriega Arroyo, Nuevo Leon. Turbinicarpus mandragora subs. zaragosae (Glass & R.A.Foster) Lüthy: has a globular to club-shaped stem up to 150 mm high tappering gradually to the tuberous root. Radial spines, 21-25, glassy white with brown tips, central spines 2, brownish black. Distribution: Zaragosa, Nuevo Leon. Notes: The variety 'zaragozae' of this species (or perhaps an independent species) does not posess the thin 'neck'. Cultivation and Propagation: It is a summer-growing species fairly easy and robust to cultivate, but very slow growing. 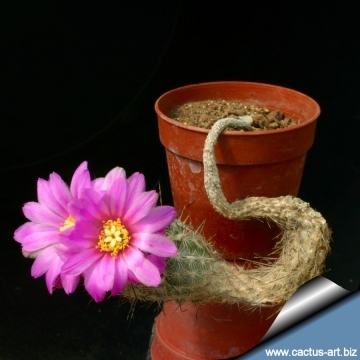 This plant is xerophytic, adapted to dry soils and is quite susceptible to over-watering if kept in a non ventilated place. Exposure: It is suited for sunny-brightly exposure, but can tolerate light shade. However it will do its best only with lots of sun and become stressed with inadequate light which could result in poor growth and unnatural shape. Direct sun is also beneficial in order to get a good spine growth. It has a good heat tolerance. Reproduction: From seed, since the plant rarely produces plantlets, or grafted. The seeds can be sown in pots of fine, well-drained sandy soil, any time during the spring when temperatures are warm. Cover the seeds with a fine layer of grit and water from below with a fungicide to prevent damping off. For the 1-2 weeks cover the pots with a sheet of glass/clear perspex to keep the humidity levels high. Remove the glass and replace it with light shade-cloth and mist once or twice a day for the next two weeks after which most seeds should have germinated. From then on mistings can be reduced to every second and then every third day as the little plants grow. The seedlings should not be disturbed until they are well rooted after which they can be planted separately in small pots. Sometimes it is grafted to avoid root rot problems as plants grafted on an hardy stock are easy to grow and no special skill is required.